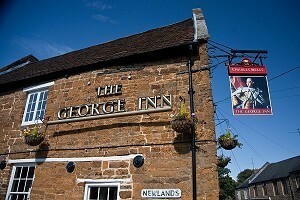 The George Inn is found in the village of Brixworth, near Northampton. Set in the countryside not far from Pitsford Resevoir. This family pub is under new Management and Gary and Lucy welcome all members of the family to have a relaxing meal or drink and enjoy the local surroundings. In the bar we have a snooker table and 3 Wide screens showing BTsports and SKY Sports. Or if you prefer you can opt for the cosy Lounge area where you can sit by our log fire after a long country walk & just relax with a meal or drink, dogs are welcome outside. Our Conservatory Dining Room is a bright airy room with comfortable seating where you can enjoy a 3 Course Meal or a Light Bite, leading from the Conservatory we have the 'Library' Room and Snug, both available for dining in. The Pub has a strong history, It is said that on the eve of the Battle of Naseby,Oliver Cromwell comandeered the pub whilst maintaining watch for the royalists from 'Cromwells eye' - a tiny window which still exsists in the old building, overlooking the courtyard. A warm welcome awaits all & The George looks forward to you making this fabulous building the hub of the village. We strive to make this your friendly local wheather calling in for a delicious meal or drink,We understand to keep its heritage the pub would not be the same without you so please call in & see us! You can look forward to enjoying our delicious Menu to suit all tastes with homemade meals on offer as well as Daily Specials. We offer a home-made Sunday Roast Dinner every week & Our Wine List has an extensive choice of Rose, White and Red served by the glass or bottle. We always have 3 Cask Ales on sale. One of which is a Guest Ale and changed every month. Also available are good quality Premium Lagers. We have the facilities to hold various functions. You can use our Conservatory area or smaller rooms for your private parties. We can accommodate Baby Showers, Christenings, Funeral Receptions, and Birthday Parties, catering for any size group. We have a small Snug room to provide small private Meeting areas for local Businesses. Please ask for details. Why not come and try our selection of homemade fish based dishes.